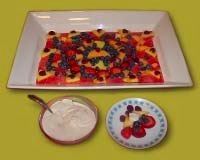 This fruit collage recipe is a fun to eat appetizer for any kid's party. Cover dip and put in refrigerator until ready to serve. Invite your child to help you arrange the fruit on a large platter. Wash hands first, and then get creative! To serve, lay the platter out with a large spoon. Serve the dip in a gravy bowl or in a regular bowl with a ladle so guests can spoon it onto their plates. Note: We used cantaloupe, watermelon, pineapple, blueberries, strawberries, and raspberries in our collage. It's a good idea to check with your guests' parents regarding any possible food allergies prior to deciding on a party menu.